Are you still struggling to handle your weekly payroll responsibilities in-house? Processing payroll is not practical or economical for small businesses when you can easily outsource it to Michael C. Huckins, CPA, P.A.. We're a local Boca Raton, FL payroll provider and CPA firm offering modern payroll solutions that will fit your business and your budget. Working with us will relieve you of the hassle of payroll processing because we offer all the services a small business requires. 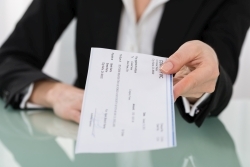 We'll set up direct deposits, create detailed payroll reports, and prepare of W-2s, W-3s, and 1099s. With us in charge of your payroll, even when you're extra busy with the daily routines of running your business, you'll know that all of your tax filings are being calculated correctly and submitted on time. When you make the move to outsource your payroll processing, you'll wonder why you didn't do it sooner. With payroll off your plate, you'll be free to devote more time to other important aspects of your business like serving clients, increasing marketing efforts, and finding ways to bring in higher profits. Call us at 561-750-2272 or request your free consultation online now to learn how we can take over all your payroll processing and payroll tax needs. Our rates are affordable for all kinds of small businesses.